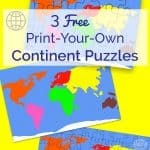 Do you like Free Printables? 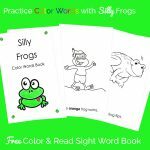 Sign up for our newsletter and get weekly-ish free literacy printables for preschool and kindergarten, along with the latest and best ideas from Books and Giggles. 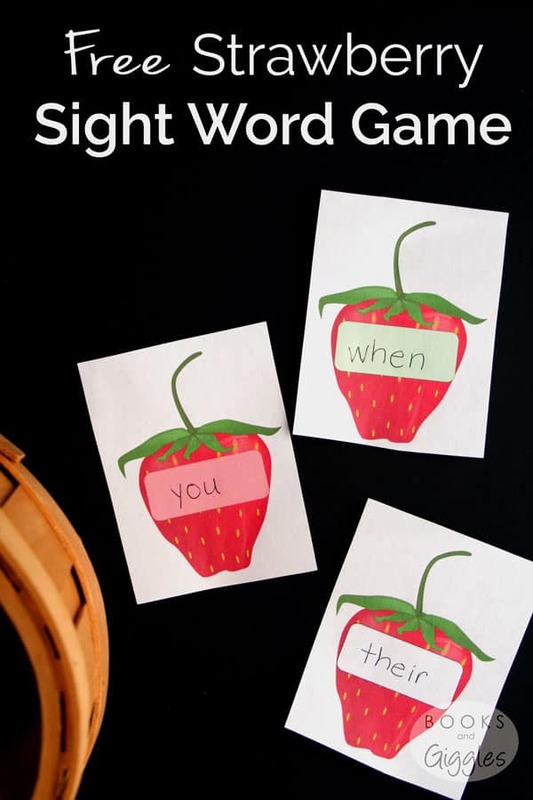 Kids learn sight words best when they’re actively engaged. 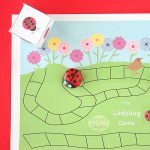 For some children, that can be sitting down playing a fun sight word game like this ladybug themed game I made. Other kids need to use their whole body! My son Liam was like that. He had no interest in doing any kind of worksheet, but if he could be active you had his attention. When we were working on sight words with him, I had to invent lots of active games to hold his interest. 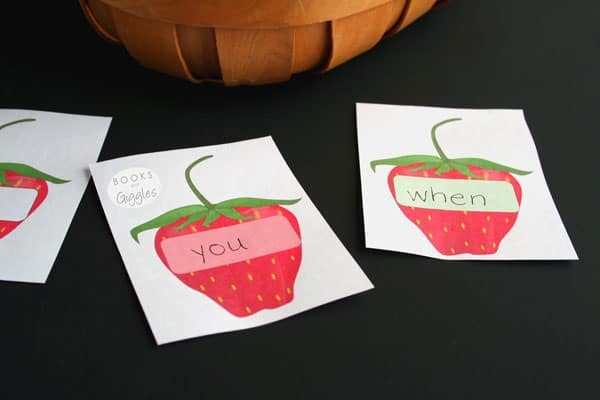 This strawberry picking sight word game is exactly the kind of activity I mean. You spread the cards around the room, and read them as you move around. This game works well for my twins too. They’re much more willing to sit and work at a table, but they also love pretend play. 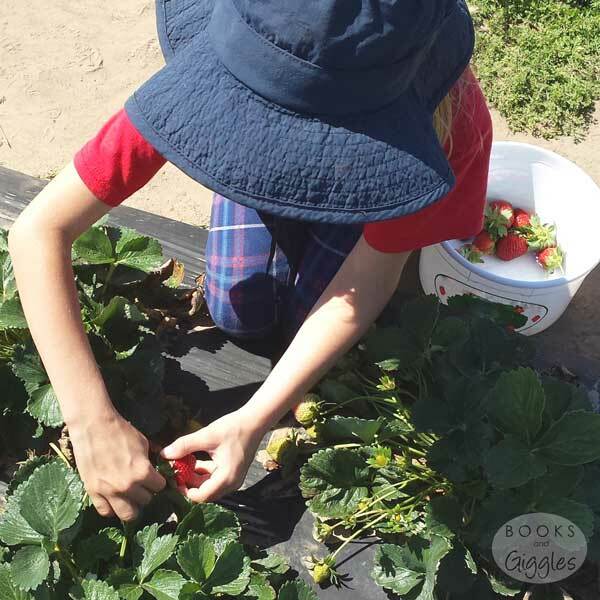 Pretending to pick strawberries definitely captures their imagination. 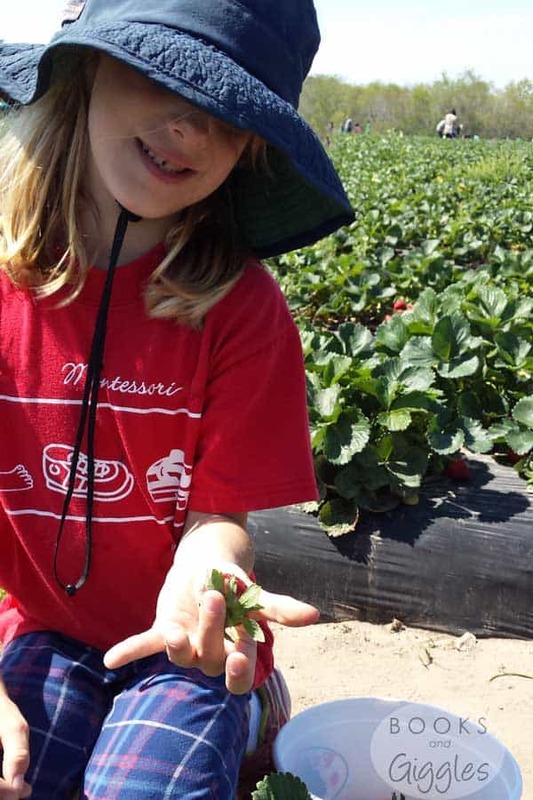 We went strawberry picking for real a couple months ago. Strawberry season comes early here in Texas. Print out the strawberry cards. Write review words on the pink cards. For the green cards, choose 3 new words, and write each one on 3 different strawberries. Also write the new words on the page with the 3 larger strawberries. Lay the cards out face down in a long row across the room. Mix the green cards in among the pink ones. 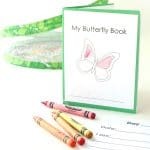 Give the child the page with the 3 new words. Review the words. Then the child pretends to go pick strawberries. They turn over each card and try to read it. If they can do so easily, they put it in their basket. If they can’t read it quickly and easily, it isn’t “ripe” yet and they leave it on the floor unpicked. After they finish going down the row, you can review the words still on the floor. Then send the child back with their basket to see if the remaining strawberries have “ripened” yet (i.e. he or she can read them). 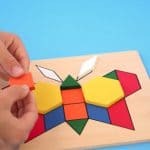 Continue until they can read and pick each word, reviewing and helping them be successful as needed. 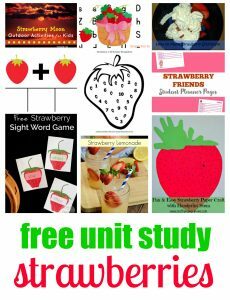 Strawberry Friends Printable Student Planner Free Pages from Look! We’re Learning!